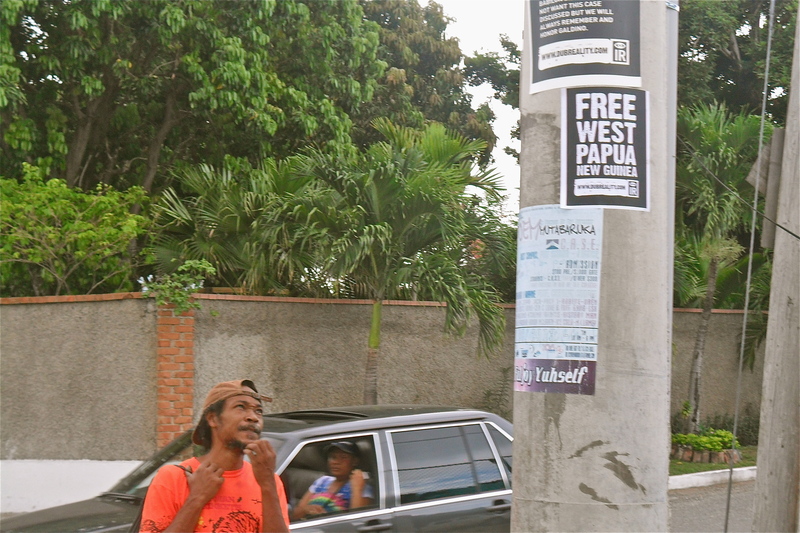 Passerby checking out IR Free West Papua & Galdino Poster in Kingston, Jamaica at corner of Maeven & Hope Road. 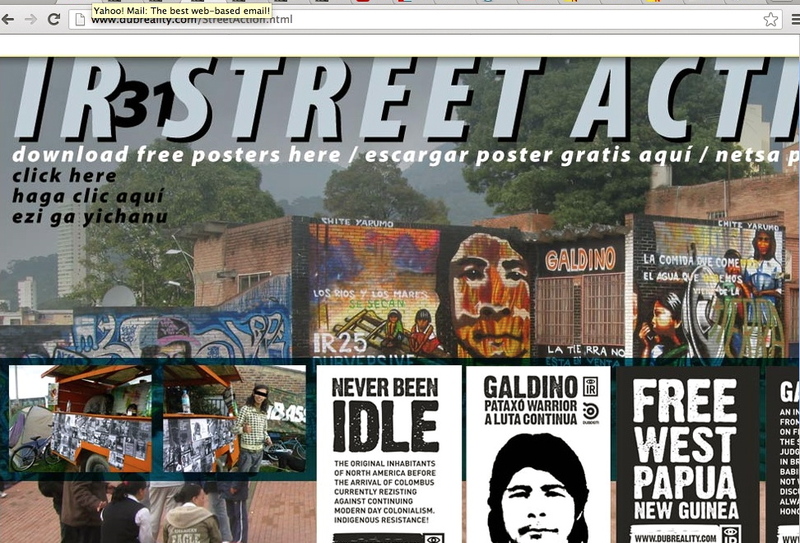 The case of Galdino is one that the system in Brazil is reluctant to deal with . If one really looks deeply into the case then you are forced to confront the racism faced by indigenous people, the theft and exploitation of their ancestral lands and other issues of social injustice in Brazil. 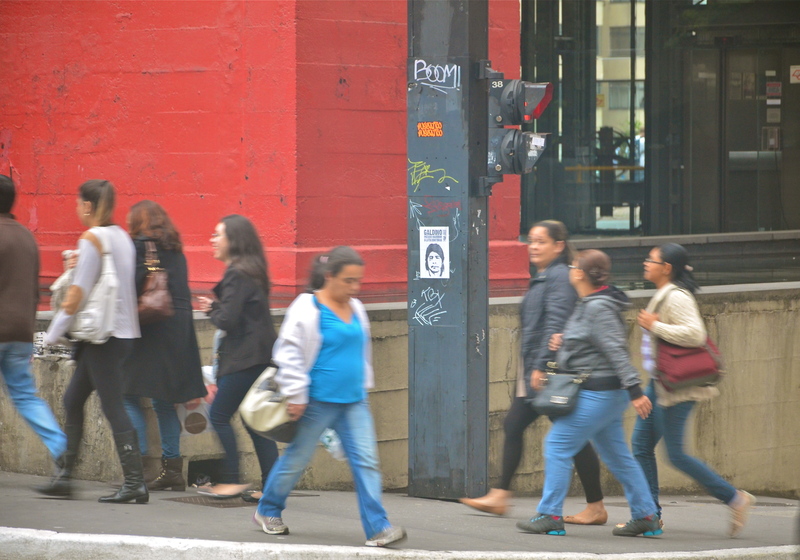 For example Galdino’s murderers said what they did was ” a joke” and it was “just” a homeless person they thought they were setting on fire reflecting the dynamics of how some with economic power in Brazil view those who they feel have less economic power. 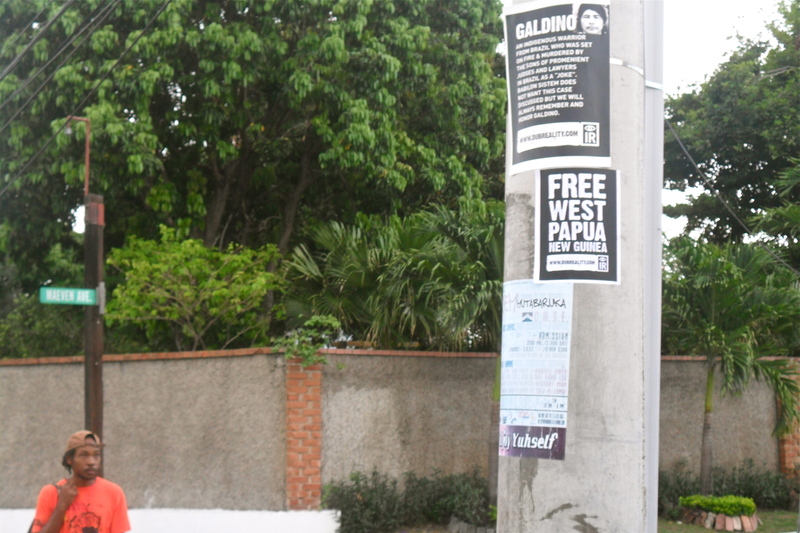 IR Galdino posters at Rua Augusta,Sao Paulo, Brazil. 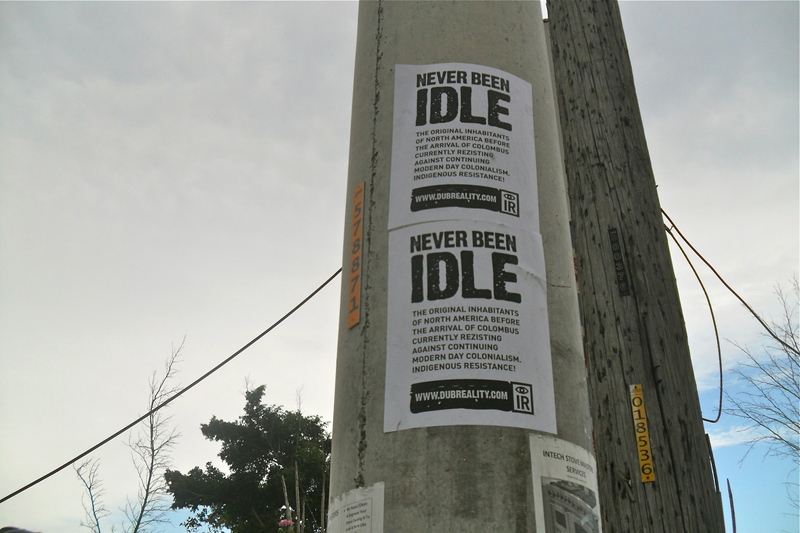 IR created the Never Been Idle posters as a homage and in support to indigenous grassroots protests that have been taking place in North America espcially in the country that most refer to as Canada. Ironically the current prime minister of Canada stated that Canada never experienced colonialism. Our position is not only did colonialism exist but it is an ongoing scenario.The original inhabitants of Turtle Islands are still today having the minerals and resources on their ancestral lands exploited for the economic benefit of the Canadian settler government without fair compensation for indigenous peoples, consideration of their traditional lifestyle & practices and without thought for potential environmental damage. At the same time despite all the official talk to the contrary there is still discrimination and ongoing genocide being practiced against indigenous people . Lets not forget that the reservation system and Indian Act in Canada was a model and inspiration for the racist system of apartheid that used to be in place in South Africa. there are some crucial lyrics here and our favorites are the ones with an edge we would could see a cool post punk band covering.We like what Hugo Burnham of the band ‘ Gang Of Four” commented : “As a drummer who only ever wrote one set of song lyrics that went on a record…I have no idea how David does this stuff without a guitar-player to constantly argue with ” Also if you are a fan of great writing and the do it yourself ethic like we are check out dave’s post ” Mud has been flung” here on the reality of self publishing .Invaluable and enjoyable at the same time.Dave also writes blog posts for the Berkley College Of Music’ Berklee Blogs.His blog posts are a favorite of The Ghost for its side splitting witty yet educational dissections of the beast called ” The Music Business” Check this post on the art writing the infamous artist bio. IR:: Indigenous Resistance has just republished our book ” Understanding The Connections Between Black & Aboriginal Peoples : The Links Between African-American, Black , Native American and Indigenous Cultures A very sincere, heartfelt reflection on our book by Maori hip-hop artist and film maker Te Kupu. The dub of his words moved us. 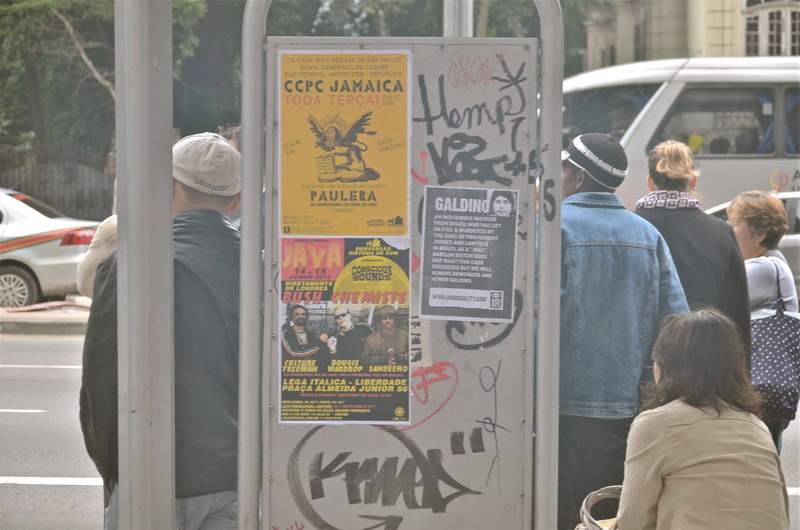 Thanx bro.”Your book is crucial in the telling of our stories, for us to look at ourselves and express our own views , instead of always having our realities viewed from the eurocentric state of mind, this is what I liked a lot – the knowledge that you weren´t viewing the people you met as the “others” but as family. It´s necessary work.” The book IR9 Indigenous & Black Wisdubs: The links between Indigenous& Black philosphy & political thought .This book features words of wisdub from folks like John Trudell, Jeannette Armstrong, Douglas Cardinal , Assatta Shakur , Jean ‘Binta ‘ Breeze. Subsequently Dutty wrote and in true dubversive , do it yourself fashion ;self published a very dub book called ” Tried & True: Revelations Of A Rebellious Youth”You can purchase his book here currently IR is putting some excerpts of this book to music. Already one track “3 lions” has been completed with music by Sawandi, Dr Das , Omar Francis with a dub beautiful mix by Ramjac at Hampstead Music & Voice Studio in UK . Another track is in the works with Dutty reading an excerpt from a new upcoming IR book IR30 Indigenous Visions In Dub alongside music created by Dj Soundar and Sawandi mixed by Ramjac.The track will also feature voices of school children in Colombia reading aloud words from ” Tried & True ” as they were being painted on an IR /Chite Yarumo mural in Bogota , Colombia. HANDS OFF ASSATTA SHAKUR …the FbI has announced they have increased the reward on Assatta Shakur to 2 million dollars… well IR did an in person collaboration with her and we say F..k OFF to the FBI ….Not only do we see this demonisation of her as a direct attack on Black women who resist but also it seems to us its a conscious effort to try to deter all those who resist espcially rebel youth in u.s.a. This is the very first mix of the track Reluctant Warrior that later became ” Committed to Life” on the Asian Dub Foundation ” Community Music ” album. This is a raw mix done by Deeder Zaman, Dr Das, Chandrasonic , Sun J and Pandit G . Its raw , done on probably 4 traks and we absolutely love it ! 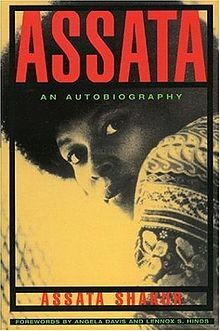 So when you hear Babylon media commentary on Assata Shakur check out her words here and form your own opinion. This entry was posted on June 23, 2013 at 2:53 pm and filed under dub releases. You can follow any responses to this entry through the RSS feed.